#4145 found @ 16:27:00, cache 63 of 63 today, geostreak Day #173. Had a grand day out today walking the Cool Cuban Spirit circuit with Kitty!! and Mr Crow. It was cold but sunny - a perfect winter day for our outing. We signed the logs as CCK to save space. I had spotted this series a few months ago while exploring the Kent map for Challenge Caches, and had set about solving them all but had not yet got around to coming to find them. At the Essex Meet a couple of days ago, I mentioned the circuit to Kitty and Mr Crow who expressed interest in joining me on my attempt today. The forecast was great, so they got to work solving the puzzles too. After a few late night back-and-forth emails, we finally had a set we both agreed on and made plans to head south of the river to start the hunt this morning. The forecast was thankfully proven right - it was a wonderfully sunny walk and the views were spectacular at various spots around the circuit. Thanks very much to the CO for kindly agreeing we could replace any which had gone (thankfully only #24) - we even found TWO caches at #21! 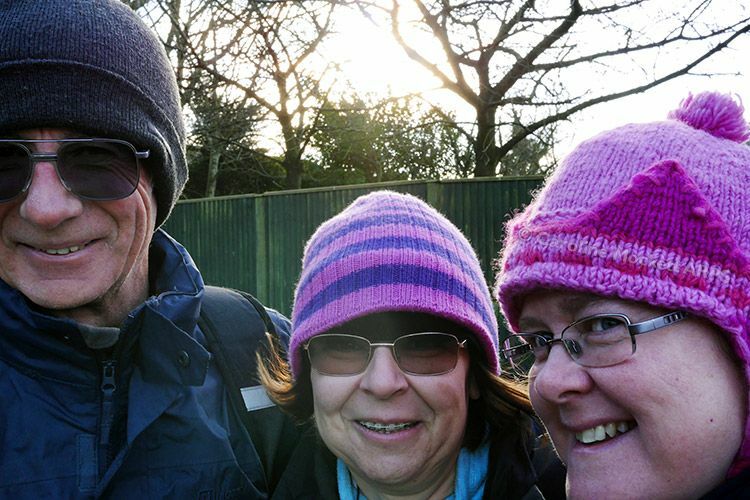 Really pleased to have had the great company of Anne and Ray for this one - I would have done it on my own, but it's always more fun to have friends along for this sort of walk. Also bagged a lovely tasty DT for the bonus here, that's another square filled on my DT grid! 63 caches in the bag was also my best day out so far Have a fave here for the whole series. Having completed our mission successfully, we headed back to Essex through the Tunnel (which was remarkably well behaved for a Friday night) and then enjoyed a tasty pub dinner to celebrate when we were closer to home. Along the track - sun's out, firm ground!